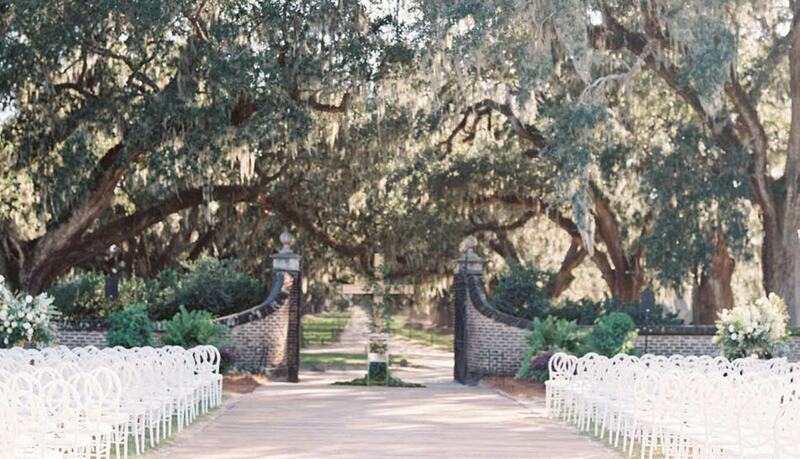 The backdrop never gets old: a stately brick entryway gives way to a deceivingly quaint, well-manicured dirt road that twists and turns until suddenly before you is the majestic Avenue of Oaks that seems to go on forever, draped on both sides by centuries-old live oaks dripping with iconic Spanish moss. The experience of the grand entrance is only the beginning of what promises to be a magical wedding at Boone Hall Plantation’s historic Cotton Dock. The Cotton Dock sits quietly and unassuming, privately tucked into the woods along the banks of Horlbeck Creek – a short walk from the stately plantation home. The over-700-acre plantation opened its doors to the public in 1956 and has been the setting for several TV series’ and movies, including “The Notebook.” Hurricane Hugo destroyed the dock in 1989, and the current event building and dock replaced it. Today, the well-manicured space is a blank canvas – a perfect backdrop for a rustic ambience or easily transformed into a stunning locale for the finest black-tie events in the Lowcountry. Brides- and grooms-to-be have the freedom to transform it themselves or to hire a planner like Boone Hall’s own Natalie Knox, who has planned and designed dream weddings of all shapes and sizes – from social events of the season to small, intimate gatherings. The main room can be transformed with bars and draperies, and the covered patio becomes a swanky lounge with furniture and chandelier rentals. The Cotton Dock is notably the wedding location for celebrity power couple Blake Lively and Ryan Reynolds, who tied the knot there in a secret 2012 ceremony and later said, amid a media frenzy over their “I dos,” that they chose it because they wanted their wedding to feel like “home,” according to several media outlets. One of the many meaningful touches Lively and Reynolds included in their wedding was the talent of Greenville native Patti Rishforth, owner of Heart Paper Scissors, who specializes in the rare art of hand-cut silhouettes, a popular Southern tradition. Rishforth, a third-generation portrait artist, has specialized in the skill for 17 years and flies to weddings around the country and internationally to create one-of-a-kind surcies for happy couples and their guests. She spent years honing her abilities to cut the silhouettes as it was done in France in the 1800s – with no drawing or tracing – just cutting. She is one of about a dozen artists in the United States known to practice this art. 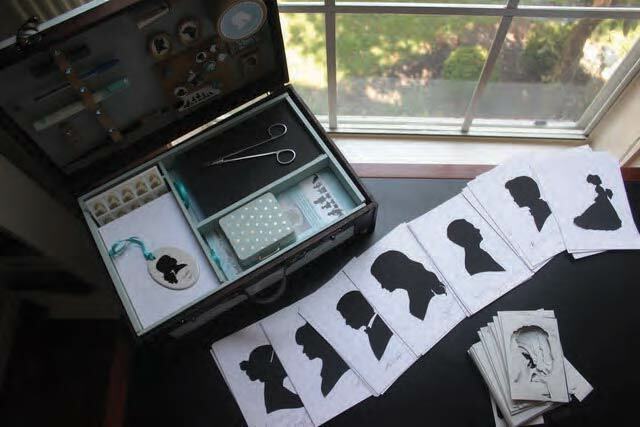 The process involves cutting a person’s profile out of a folded piece of paper, which creates two identical silhouettes. For weddings, Rishforth gives each guest one copy of their profile as a keepsake and places the other copy into an album to create a visual guestbook where guests can also sign or write well-wishes. To Rishforth, the idea that the bride and groom can look back years later and recognize the shape of their friends’ and family members’ faces and what they wrote that day is very meaningful. “It’s fascinating that a black blob can look so much like a person. It’s not about their clothes or skin tone or eye shape or any of that – it’s in a completely different class than a photo booth,” she added. Unique and thoughtful additions like Heart Paper Scissors can help a wedding blossom from what may be considered “just another reception” to a meaningful experience that stands out to every friend and family member in attendance. “I hear a lot of people talking about the bride or groom, saying ‘Oh, she’s always been so creative,’ or ‘Oh, this is so like her. How did she think of this?’ referring to the silhouettes,” Rishforth continued. At the Lively-Reynolds wedding, she recalled that the guests were enthralled. She also creates a full-figure silhouette of the bride and groom to include in the album, which becomes a point of interest for guests as they watch Rishforth work her magic while the happy couple poses in a loving gaze. Full-figure silhouettes routinely take about seven to 10 minutes to complete, but individual silhouettes are usually done in just a couple minutes. The short time required for the art form, she said, is perfect not only for guests but also for kids. Rishforth got her start doing pencil portraits of children at boutique children’s stores and learned the art of cutting silhouettes after many requests for her to offer it in-store. One of those stores was Southern Belles: A Children’s Clothier, in Mount Pleasant. Southern Belles has been providing swoon-worthy clothing to Mount Pleasant families for over 20 years and has an extensive line of options for the perfect flower-girl dress or ring-bearer suit for the youngest members of a wedding party. Though small in stature, the role these pint-sized children portray is big and often so is the effort to find the right clothing for the occasion. 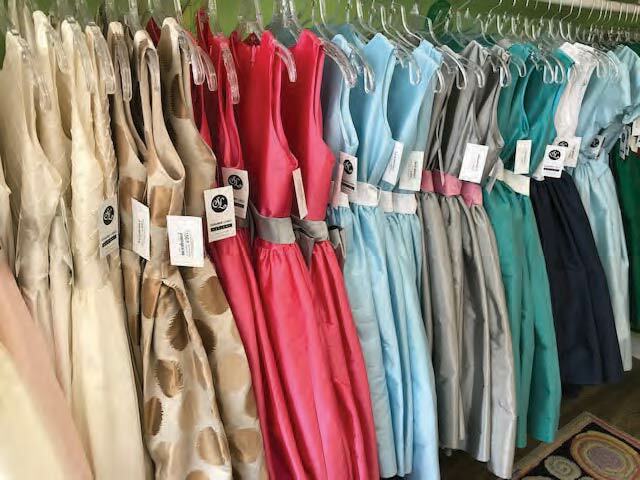 With an entire section of the store dedicated to clothing for special occasions, Southern Belles’ options range from one-of-a-kind outfits to special orders to off-the-rack. Brands like Isabel Garretón, Susanne Lively and LuLu BeBe are cut to order, while Us Angels is a classically styled dress that is moderately priced – something to consider for a dress that may only be worn once. Southern Belles is a one-stop shop for children’s wedding attire, which is a blessing for parents trying to choose all of the accouterments while wrangling a small child. From head to toe, from bows and satin headbands to tights, socks and a full-service shoe section, parents can find the perfect ensemble for their child to walk down the aisle or to be in the audience. Weddings run the gamut in every direction – big or small, rustic or fancy, subdued or over-the-top – but some elements transcend all of those. In Charleston, an idyllic location, thoughtful gestures and a well-dressed wedding party – even down to the smallest member – are just a few.